The countdown is on! Christmas is right around the corner and though we won't be home for the holidays this year, I still wanted to add some festive touches around the house. There are a lot of experiences you may consider leaving out of your wedding day but please, make sure the guestbook isn't one of them! It's such a great opportunity to create a unique and personalized memento of your big day, and something look back on over the years. For our wedding this past September, I created this Vintage Photo Album Guestbook as a way to collect heartfelt messages and snapshots of everyone at the wedding (including the bride and groom!). The first item is definitely going to be the trickiest to pull off. I bought two vintage photo albums at separate local antique shows and found plenty more after several trips. The key is to keep digging. You'll want an album that either has plenty of blank pages or has the hardware to add/remove pages. In this case, I used the interior blank pages from one album and wrapped them in the cover of a second album with a more appealing exterior. Most of the time these photo albums are filled with creepy old photos from the early 20th century but we can fix that. Once you've found the perfect album, fill it with construction paper or cardstock that complements its exterior. You can use the old pages as a guide for trimming the new pages. The best part about this is that you can fill the album with as many pages as you think you'll need (add a couple extra just in case - they can be removed later!). The next step is choosing a camera. I bought a Fujifilm Instax Mini 8 Instant Camera in Edgy Black with a boatload of film on Amazon. I've seen the same cameras in every colour at Michaels as well. Urban Outfitters now has a variety of really cool vintage replica polaroids too (if you're budget is a little higher). Once you've got your camera and film, take a test shot - you'll need this first polaroid as a guide. I decided to create the layout for the interior pages prior to the wedding. It made it easier for our guests to interact and kept the pages consistent. 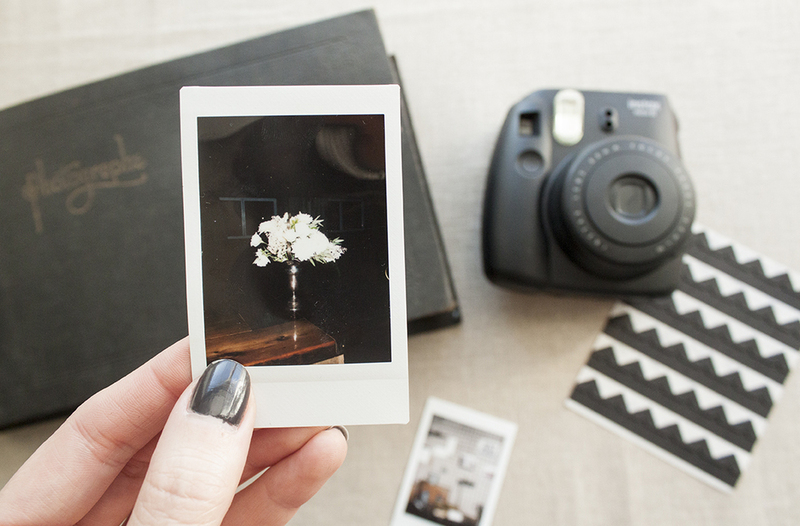 Take four photo corners and, rather spending time meticulously measuring, place them on the corners of your polaroid. Carefully stick the polaroid to the page, pressing all the corners down, and remove the polaroid. Now you know that the polaroid will fit in the photo corners with wiggle room - guests don't want to be fidgeting with photo corners that are too exact! Repeat as many times as will fit on the page, making sure to leave room for a messages section beside or below each (optional). Finally, grab some white chalk pens or ball point black pens, depending on the colour of your paper, and lay everything out on the table. This process may not be as intuitive as it seems so make sure to include a sign with instructions. Don't forget to have the extra film on hand for refills (they will happen often). Note: Add a couple of our Vintage Cameras to fill out the table and really hit home that vintage photography experience. I couldn't be more happy with the result. Not only did the majority of guests participate, but they had a lot of fun with it (we even got more than a few selfie photoshoots). It was pretty fun going through the pages the day after the wedding - I really had no clue what to expect. A huge thank you to our family and friends - this guestbook would be empty without you! I get it. You're a plant killer. You've neglected countless plants that have met their end under your lack of care. But you just haven't found those convincing fake substitutes and, more importantly, haven't given up hope. My advice to you: get on board the succulent train and start small. Try your hand at a (mini) terrarium. Succulents are like the anti-gardener's plant. They take little to no care at all - in fact, they actually suffer from too much care (just ask my mom, a legitimate gardener who actually managed to kill one due to overwatering). All they need is some direct sunlight and a cute little nook to settle in for a good long life. Find a container, vessel, or any object that can hold dirt. I've chosen this antique gold trimmed glass box from Terra. It's a good size for holding a little village of tiny plants and can be closed when the cat comes around. (If anyone has figured out how to stop cats from chewing on plants, please let me know). I also like the idea that you can see through the sides, which will come into play later. Note: Our gold glass holders would make perfect terrariums for a whimsical head table! Pick your succulents! This is the fun part. There are so many varieties to choose from if you know where to look. And don't worry, I'll tell you! I found a couple succulents here and there at Walmart and Fortinos but hadn't had much luck with quantity and variety. I literally just bought every succulent I could find for a while (which was two or three at most). It wasn't until my mom, after her horrific succulent accident, went on the hunt for a new source and struck gold - Connon Nurseries in Waterdown. This place is succulent heaven. Not only do they sell a dozen different types, they all come in small, medium, large, and even extra large. There are fuzzy cacti, aloe, echeveria, dudleya (these are the classic chalky-looking ones), graptopetalum, and so many more! Yes, I had to look all these names up - I base all my succulent selections solely on how pretty they look. The point is, the choice is yours. I'm not aware of any harmful combinations or restrictions so experiment with different types. At a couple bucks each, it's not a big commitment to figure out what works for your arrangement - hence the 'start small' tip, because your addiction will grow... unlike your succulents which will stay the exact same size forever (incredible). Fill that container! Depending on the size and shape of the container you chose, you might need more or less filler, or none at all. In this case, I started with a layer of white rocks, filled in the gaps with sand, and topped it off with dirt. Now this is crucial for the whole not-drowning-your-succulents thing. The dirt is perfect for absorbing water but too much and our new babies will drown. The rocks and sand will soak up and excess water, taking one for the team and keeping this terrarium in top shape. I love that you can see all the layers from the side - kind of like one of those worm houses without the disgusting worms (did I mention I didn't get my mom's green thumb?). That's it! Place your container somewhere where it can get sunshine and you're good to go. As for watering, I only do so when I actually remember (once every two weeks-ish). A great place for even lower maintenance is in your bathroom. The moisture from the shower will keep your little guys nice and happy.